This momentous Epistle was revealed by Bahá'u'lláh in the last year of His earthly life. It is addressed to Shaykh Muhammad-Taqí, known as Áqá Najafí, a son of Shaykh Muhammad-Báqir who was stigmatized by Him as 'Wolf'. * After the death of his father in 1883, Áqá Najafí succeeded him as a leading mujtahid of Isfahán. He was an inveterate enemy and formidable opponent of the Cause of Bahá'u'lláh, a vicious and evil-minded clergyman who fulfilled the famous saying: 'The child is the secret of his sire.' He well merited the title 'Son of the Wolf'. In his younger days he collaborated with his father in pursuing the policy of murdering the Bahá'ís. He was the one who rolled up his sleeves on the occasion of the martyrdom of the King and the Beloved of the Martyrs and announced his readiness to carry out their execution personally should the official executioner refuse to co-operate. Once he assumed office it was through his instigation and on his direct orders that the great upheavals against the Bahá'ís occurred in Isfahán and neighbouring townships. It was by his command that several believers were put to death, and in 1903 he was the chief instigator of the upheaval of Yazd, the bloodiest massacre of the Bahá'ís since the bloodbath of Tihrán in 1852. * see above, ch. 6.
weighty Epistle. The opening paragraph is in praise of God, and the second, in praise of Bahá'u'lláh as the 'Supreme Mediator', 'the Most Exalted Pen', 'the dawning-place' of God's 'most excellent names', and 'the dayspring of His most exalted attributes'. 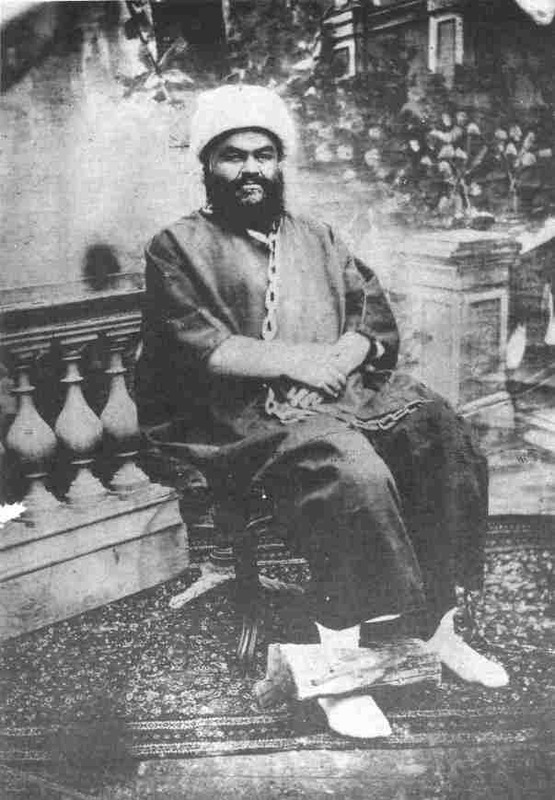 Having unequivocally announced His own station to Áqá Najafí, Bahá'u'lláh in the next paragraph proclaims to him that 'the ear of man hath been created that it may hearken unto the Divine Voice of this Day', counsels him first to 'purify' his soul 'with the waters of renunciation', to 'crown' his head with 'the crown of the fear of God' and then to arise from his seat, turn his face in the direction of Bahá'u'lláh's abode and recite a prayer which is revealed especially for him. No one but God can address a man in this way and lay bare before him his sinfulness and transgressions. Never for one moment did Áqá Najafí look upon himself in the light of this prayer while on this earth. But no doubt he has been able to see his true self in the world beyond, like every other soul, and discover how grievously he erred in his earthly life. remarks. While denouncing his machinations, He is never extreme in His words. His dispassionate exposition of His teachings, His explicit description of the circumstances of His Revelation, His profound arguments setting forth the proofs of the validity of His Mission, His challenging remarks addressed to His adversaries, are all interwoven with passages reflecting His compassion, His exalted counsels, and His unbounded love for His servants, whether friend or foe. In His Tablets Bahá'u'lláh occasionally quotes passages from Writings He has previously revealed. But the Epistle to the Son of the Wolf is different, in that it contains a great many quotations from His earlier Tablets. It includes an anthology of His Writings, chosen by Himself. We have already described in previous volumes* the manner in which Bahá'u'lláh revealed His Writings and the speed with which His amanuensis was empowered by Him to write down His words. Whereas any compiler will copy the required source material for his quotations, the Revealer of the Word of God does not follow this pattern. It is inconceivable to imagine that when He wished to quote from a previous Tablet, Bahá'u'lláh would stop the flow of His Revelation and direct His amanuensis to insert a certain part of a Tablet as a quotation. It must be remembered that Bahá'u'lláh revealed about fifteen thousand Tablets during the forty years of His Ministry. Most of these were not easily accessible at the time, and none of them were indexed so as to enable one to retrieve a desired passage from among so many pages. For Bahá'u'lláh's amanuensis or anyone else to try to find part of a Tablet in those days would be very much like looking for a needle in a haystack. * see vol. 1, ch. 3.
poured down like copious rain. To suddenly stop this heavenly outpouring and busy oneself with the cumbersome task of looking for a passage among so many pages, would not only have been inconsistent with the dignity and majesty of the Revealer of the Word of God, but would also degrade him to the position of a human author. Thou knowest full well that We perused not the books which men possess and We acquired not the learning current amongst them, and yet whenever We desire to quote the sayings of the learned and of the wise, presently there will appear before the face of thy Lord in the form of a tablet all that which hath appeared in the world and is revealed in the Holy Books and Scriptures. Thus do We set down in writing that which the eye perceiveth. Verily His knowledge encompasseth the earth and the heavens. * see above, pp. 47-8.
noticeable in the original language, for the translation into English is not affected by the change of an adverb or a preposition. To cite an example: in the Epistle to the Son of the Wolf, Bahá'u'lláh quotes the 'second leaf of the Most Exalted Paradise' from His Tablet known as Kalimát-i-Firdawsíyyih. The phrase 'Pen of the Most High' in the original Tablet is re-revealed in the Epistle to the Son of the Wolf as 'Pen of the Divine Expounder',* but the rest of the quotation remains the same as in its original form. A deep study of the Epistle to the Son of the Wolf requires some knowledge of Islámic subjects. A detailed study of these is beyond the scope of this book, but some brief notes are given in Appendix 3, and the English edition also has a useful glossary. Some historical events too need explanation, but most of these have already been described in this and former volumes; references will be given to these where necessary. * see Tablets of Bahá'u'lláh, p. 63, and Epistle to the Son of the Wolf, p. 28. † For details of the Lawh-i-Sultán see vol. 2, pp. 337-57, and vol. 3, ch. 9. * For an interpretation of this passage by 'Abdu'l-Bahá see vol. 2, pp. 346-7. 4. Epistle to the Son of the Wolf, p. 11. 12. Epistle to the Son of the Wolf, p. 15. * After the ascension of Bahá'u'lláh he broke the Covenant and rose up against 'Abdu'l-Bahá. For more information see the Will and Testament of 'Abdu'l-Bahá. The present author intends to give an account of his misdeeds in the forthcoming volumes entitled The Covenant of Bahá'u'lláh. 23. Epistle to the Son of the Wolf, pp. 93-4. [Be generous in prosperity...] Gleanings From The Writings Of Bahá'u'lláh, CXXX; The Revelation of Bahá'u'lláh, vol. 3, p. 231.
enemies. The upheavals of Mázindarán, Nayríz and Zanján* are typical examples. Since they took up arms and defended themselves so valiantly, the Bábís were highly feared by the Persian populace. This sense of fear was heightened by the attempt on the life of Násiri'd-Dín Sháh by a few irresponsible Bábís in 1850. * For details see The Dawn-Breakers. 24. Epistle to the Son of the Wolf, pp. 21-2. Not only were the public given wrong impressions about the conduct of the believers: Násiri'd-Din Sháh himself is said to have been afraid throughout his reign even of coming face to face with a Bahá'í. This fear was somewhat understandable, because he always remembered the attempt on his life. * see above, pp. 294-301. † For his life story see vol. 3, pp. 91-107, and vol. 3, Appendix 2. ‡ For an account of his life see vol. 1, pp. 84-91. 25. Epistle to the Son of the Wolf, p. 25.
circles. A detailed account of their brilliant discussions is beyond the scope of this book. When Násiri'd-Dín Sháh became aware of this, he is reported to have intimated to his son, the Náyibu's-Saltanih, that he desired to meet Mullá 'Alí-Akbar but feared to come face to face with the prisoner. The Náyibu's-Saltanih assured his father that there was no danger involved. But the Sháh would not take the risk. Mullá 'Alí-Akbar was consequently brought into a room; the Sháh looked from behind a window at the dignified and composed person of Mullá 'Alí-Akbar in chains and fetters, majestically seated on a chair. The Sháh was so impressed that he ordered his photographer to take a photograph of him in that condition (see opposite page). Night and day hath this Wronged One been occupied in that which would unite the hearts, and edify the souls of men. The events that have happened in Persia during the early years have truly saddened the well-favored and sincere ones. Each year witnessed a fresh massacre, pillage, plunder, and shedding of blood. At one time there appeared in Zanján that which caused the greatest consternation; at another in Nayríz, and at yet another in Tabarsí, and finally there occurred the episode of the Land of Tá (Tihrán). From that time onwards this Wronged One, assisted by the One True God--exalted be His glory--acquainted this oppressed people with the things which beseemed them. All have sanctified themselves from the things which they and others possess, and have clung unto, and fixed their eyes upon that which pertaineth unto God. O Shaykh! This people have passed beyond the narrow straits of names, and pitched their tents upon the shores of the sea of renunciation. They would willingly lay down a myriad lives, rather than breathe the word desired by their enemies. They have clung to that which pleaseth God, and are wholly detached and freed from the things which pertain unto men. They have preferred to have their heads cut off rather than utter one unseemly word. Ponder this in thine heart. Methinks they have quaffed their fill of the ocean of renunciation. The life of the present world hath failed to withhold them from suffering martyrdom in the path of God. 28. Epistle to the Son of the Wolf, pp. 88-9. † see vol. 2, pp. 245-59. 31. Epistle to the Son of the Wolf, pp. 71-2. * see above, ch. 5. 32. Epistle to the Son of the Wolf, p. 72.
to Isfahán where he was put in prison. Prince Mas'úd Mírzá the Zillu's-Sultán summoned Mullá Kázim to his presence, and when he refused to recant his Faith the Prince implemented the death sentence and ordered his execution. This was in 1877. The execution took place in a large public square, the famous Maydán-i-Sháh, where great crowds had assembled to watch. Having refused to recant his Faith and be freed, Mullá Kázim was beheaded by the executioner. Shaykh Muhammad-Báqir ordered his corpse to be hung upside-down from a pole situated on the executioner's platform. The rope from which he was suspended broke and his body fell down from a great height. His smashed body was again suspended and the Shaykh announced that anyone who threw a stone at the corpse would assuredly secure a place for himself in paradise. A frenzied crowd carried out the attack. For two days men and women could be seen walking long distances carrying stones. Even pregnant women who could hardly walk took part in this shameful crime. When the body was deserted at night some men even gouged out the eyes and cut off the fingers, the nose, the lips and the ears. On the morning of the third day Shaykh Muhammad-Báqir arrived on the scene. Not satisfied with the savage indignities which had been heaped upon the victim, he ordered the corpse to be lowered to the ground for a horseman to gallop over it. And when every part of the corpse was broken, it was delivered to the flames and the charred bones were thrown into a disused well. As to Ashraf mentioned in the passage cited above, he was a native of Najafábád, but since he lived in Ábádih for some time he became known as Mírzá Ashraf of Ábádih. He was a great teacher of the Faith who enabled many souls to embrace the Cause of God. He travelled to India, stayed for some time in Bombay and eventually went to live in Isfahán. He had such a radiant personality that people were drawn to him for his spiritual qualities, his piety and his knowledge. with rage when he discovered that it was Mírzá Ashraf who had been teaching the Faith to these two. He arrested Ashraf and put him in prison. A few days later the Prince invited a number of divines including Áqá Najafí (the Son of the Wolf) to interrogate Mírzá Ashraf in his presence. With great eloquence and conviction Ashraf in a loud voice, which could be heard outside the room, declared his beliefs and proved the validity of the Faith he had embraced. Confounded and utterly helpless to refute his arguments in support of the Faith, the divines used their usual weapon of denunciation. Áqá Najafí wrote Ashraf's death sentence and delivered it into the hands of the Prince who ordered his execution. Mírzá Ashraf was executed on 23 October 1888 by hanging in the same public square as Mullá Kázim. By order of Áqá Najafí, his body was trampled underfoot, savagely mutilated by the mob, delivered to the flames and then thrown into a ditch and a wall pulled down over it. These barbarous acts of killing were typical of the way in which a great many Bahá'í martyrs met their deaths in a spirit of resignation and reliance upon God. * see in order mentioned above: vol. 3, ch. 9; vol. 2, pp. 222-3; vol. 2, pp. 60-61; vol. 2, pp. 223-30; vol. 2, pp. 128-36; vol. 1, pp. 101-3. 34. Epistle to the Son of the Wolf, p. 73. Mullá 'Alí-Ján was a native of Mázindarán and was born in the year 1846. In his youth he displayed a passion for acquiring religious knowledge. He therefore studied Islámic theology and became well-versed in the Qur'án and the traditions of Islám. One day he came across some traditions extolling the merits of the city of 'Akká. He was puzzled by this, and no one among the divines could explain to him the significance of these traditions. He searched for an answer until he came across a well-known Bahá'í who taught him the Faith. Embracing the Cause of Bahá'u'lláh endowed Mullá 'Alí-Ján with new vision, and his religious passion found an outlet in the teaching field. With exemplary devotion and enthusiasm he taught the Faith to many souls; he even took the unusual step of proclaiming the Faith from the pulpits of the mosques. This resulted in great numbers entering the Faith in different villages. * see above, pp. 342-4. † For the Lawh-i-Sultán see vol. 2, ch. 16, and vol. 3, ch. 9. For the Tablet to Napoleon III see vol. 2, pp. 368-9, and vol. 3, pp. 110-15. For the Tablet to Czar Alexander II see vol. 3, pp. 118-23. For the Tablet to Queen Victoria see vol. 3, pp. 123-8. In a passage addressed to the Shaykh Bahá'u'lláh recounts some of the ordeals He was subjected to in the earlier days in Persia. * For details see The Dawn-Breakers, pp. 368-76, and above, p. 148. † see vol. 1, p. 9. * see vol. 1, pp. 62-4.